This review is an unconventional approach due to the item not actually being on the market. However, come to its release (supposedly sometime in 2019) could potentially change how we interact with Virtual reality. The company Teslasuit is on the forefront of full body haptic suits this day and age. Their website currently states that they are ina current stage in production where they are only releasing developmental units for game developers. This is so VR game developers have a chance to test their games with a haptic sensing suit and to make sure it’s calibrated with their game correctly. The suit currently doesn’t have a set price however, their brief Kickstarter campaign had the suit set at 1,500 dollars, a pretty steep price point. If you aren’t familiar with the haptic suit concept, it is essentially a device that delivers real sensations designed to mimic environments in the digital space. This process is triggered by haptic sensors inside the suit that stimulate muscle groups using electrical feedback. This means that when a person is using the suit they are able to feel the simulations of any bump, push or shocks that occur in the digital space. The company states that the Teslasuit will in no way actually hurt the user or disrupt the muscle groups, it only uses electrical impulses to simulate the natural responses that the muscles already facilitate. Not only is the Teslasuit is designed with haptic sensing the suit also allows for climate control, motion capture and biometric systems. Among these systems, the suit also allows for tracking of the user’s heart rate, stress levels, and mental/emotional states. This is to allow more data to flow through the user to the developer to enhance and adapt the experience to how the user feels. The Telasuit is equipped with 68 channels throughout the suit to help deliver electrical simulation, the company is also working on expanding that number to further increase the immersive experience. 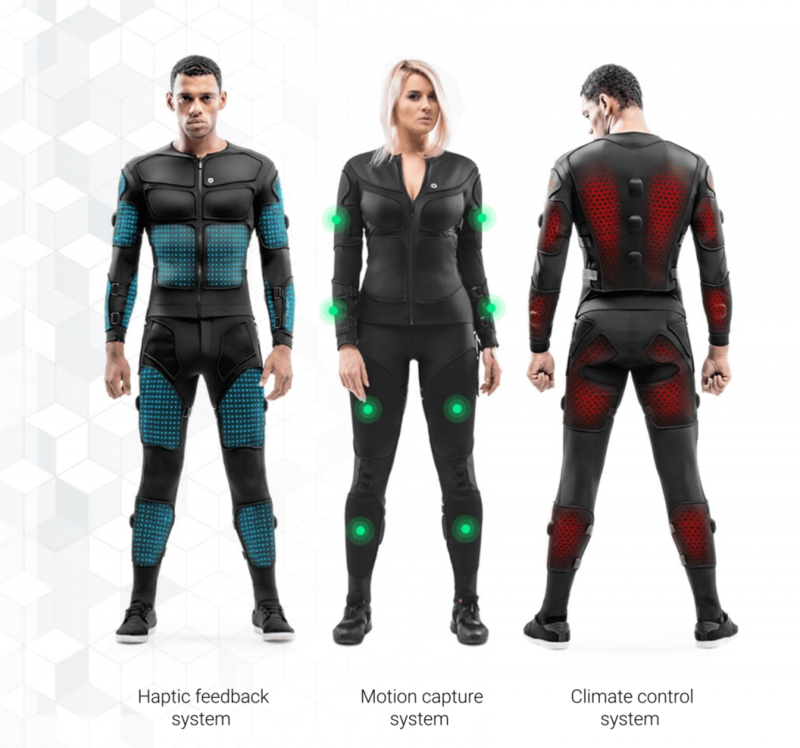 Along with the haptic sensing, the climate control lets the user feel the intended climate of a virtual space and adjusts the temperature of the suit (heating and cooling) to best simulate the virtual environment. The suit is said to have a 10 hour battery life as well as being completely wireless (connecting via Bluetooth or WiFi) and on top of all of that the suit is even washable. While I believe this suit will revolutionize the gaming industry I find that this sort of device will be invaluable to the business side of things. It would allow for more realistic hands-on training. The company released a blog post discussing VR-training demo for different industries on this website that can be found here. In this article goes into the various industries software and equipment like this could be used such as astronaut VR training, emergency evacuations, and even oil-loading ramp operations. This kind of tech could also be used in the medical field to help training doctors to get more hands-on experience in the surgical room instead of working on real people. Should this device make it to the commercialized markets it will forever change our interactions with the digitals spaces that we know, and I for one, look forward to seeing it.